As mentioned in my First Impressions article for this game, I was initially attracted to this game due to its claim of being "a prog rock concept record you can hang out in." I'm a fan of prog rock bands such as Pink Floyd, Genesis and Yes, so I was thinking that an adventure game with an awesome prog rock soundtrack (created by professional musician Jim Guthrie) would be a good investment, especially considering it was on sale when I purchased it (and it's currently $8 USD full price). What I was more concerned about was how good was the actual story and how fun was the game to play? 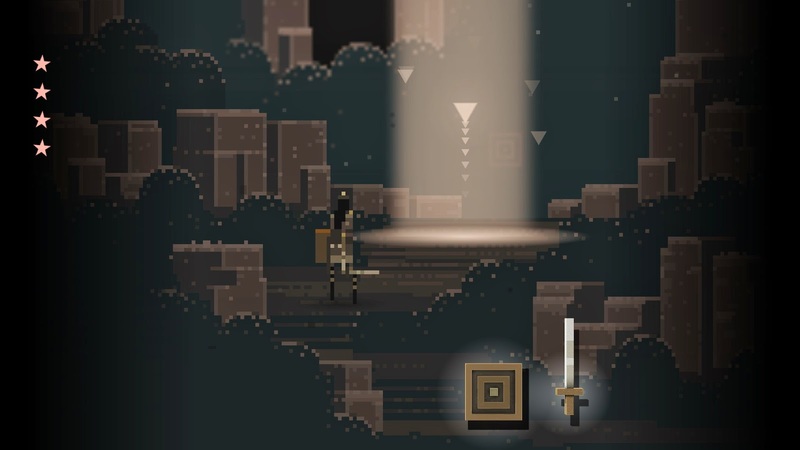 Superbrothers: Sword & Sworcery EP (I'm just going to call it S&S from now on as its full title is a bit of a mouthful) is set in a strange fantasy world where you play the role as a heroine called "The Scythian". Incidentally, Scythians are also an ancient tribe that lived in the Northern Caucasus region and the Caucasus Mountains do get mentioned in this game not to mention that Mingi Taw, the mountain you're meant to ascend as part of your quest, is another name for Mount Elbrus which is part of the Caucasus mountain range. So the game is apparently set in a real region of Earth but the events that occur in the game are pretty trippy. Like most fantasy stories, your quest is to defeat a great evil and in this game your nemesis is known as The Golgothic Mass. Equipped with nothing more than a sword and shield, your character has to first scale up the mountain to claim something known as the Megatome in order to dabble a bit in the art of "sworcery". Having a bit of "sworcery" up your sleeve will be crucial in defeating the big bad boss. I won't go much more into it but despite most of the usual fantasy tropes being there, it manages to be different and surreal enough that it compels me to learn more about the world(s) The Scythian explores. Making fun of those aforementioned fantasy tropes also helps make this game even more appealing as we find that The Scythian is quite sarcastic, characters in the story communicate using something very similar to Twitter (you can also tweet your progress in the game to the real-life Twitter), objects and activities in the game have funny names (such as "woeful errand" instead of "mighty quest"), and the tale often breaks the fourth wall. The only reason I didn't give a perfect score for the plot is that while most things in the ending make some sense, there are a few things that do not - so much so that there's a very long winded thread here discussing it (and still investigating what one part of the ending means almost two years later). I like to think that S&S is one part Karateka (the new version) and one part Loom. The "Sword" part of the game involves the combat sequences which reminds me of the combat sequences used in Karateka. It basically all boils down to timing: when to block your attacks and when to counter-attack. Your opponent gives little cues as to what kind of attacks he will perform against you, just as it was with Karateka. Once you've figured out the rhythm of the combat, it can start feeling rather dull - so it's fortunate that combat isn't the only aspect of the game. 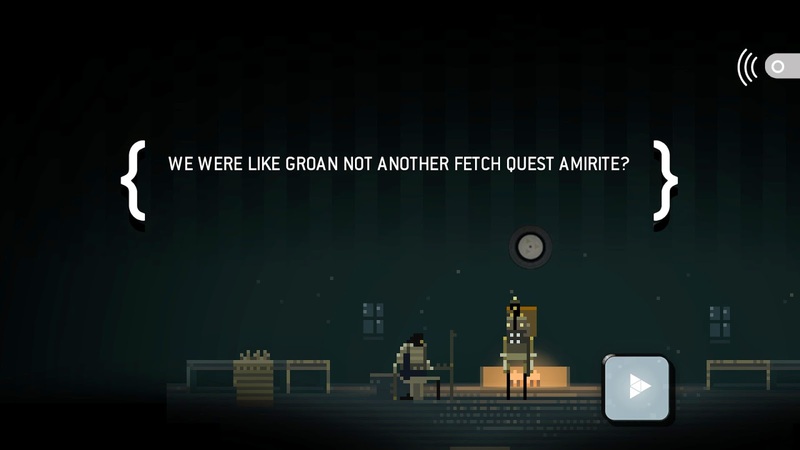 The other major component of the game is the "Sworcery" part which reminds me of games like Loom. While S&S is by no means as difficult as Loom (and Loom is pretty easy on the lower difficulty settings) it employs similar mechanics for its magical puzzle segments where it mainly involves clicking or swiping at things in the correct sequence in order to unlock something. It is a refreshing break from having a game simply about combat although there's nothing too challenging being done here making the game a very casual affair. Besides fighting and performing magic rituals, you'll be spending the rest of your time just exploring the world and interacting with its inhabitants: with lumberjacks like "Logfella". Sounds like a pretty cool dude. Voice acting is minimal with only a few choice samples spoken by Logfella the Lumberjack (if I'm not mistaken). The general background audio consists of the sound of water falling, birds chirping and the wind howling which fits the scenery you visit perfectly. When I first listened to the game's music, I must admit that I was slightly disappointed since the music didn't sound anything like my expectations of prog rock. Consequently I felt like I was a bit misled in purchasing the game. Nevertheless, I quickly warmed to the music since even if it isn't what I think prog rock should sound like, Jim Guthrie has done a sensational job regardless, making The Scythian's adventure seem truly surreal and magical. Graphics in the game are pretty basic, there's no denying that. While this might help you exercise your creativity more, that's what us old-timers used to do when playing some games in the 1980s, it also means the game looks as if it was developed in the 1980s - like it is King's Quest except with more than 16 colours. The game is a bit short at 4.5 hours but this isn't actually too bad for an adventure game (when you consider a classic adventure game like Loom only takes a couple of hours to complete, provided you know what you're doing of course). The game does have some Steam achievements you can go hunt but you're likely to get a majority of them just finishing the game normally. I didn't notice any serious bugs but the mobile phone game mechanics do annoy me somewhat. What do I mean by this? Instead of using simple mouse clicks to perform certain actions in the game you instead have to hold the mouse down and swipe over your screen, which obviously works fine (and is the only way you could possibly do it) on a touch screen device such as a mobile phone or tablet, but it seems a bit cumbersome at times when using a PC's mouse. 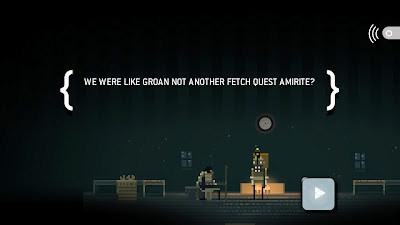 Despite Superbrothers: Sword & Sworcery EP not having particularly entertaining game mechanics, you will still be compelled to learn more about the surreal and magical worlds The Scythian explores. As an added bonus, the music that accompanies the game, by Jim Guthrie, is perfect and purchasing the game off Steam grants you a free digital copy of it.